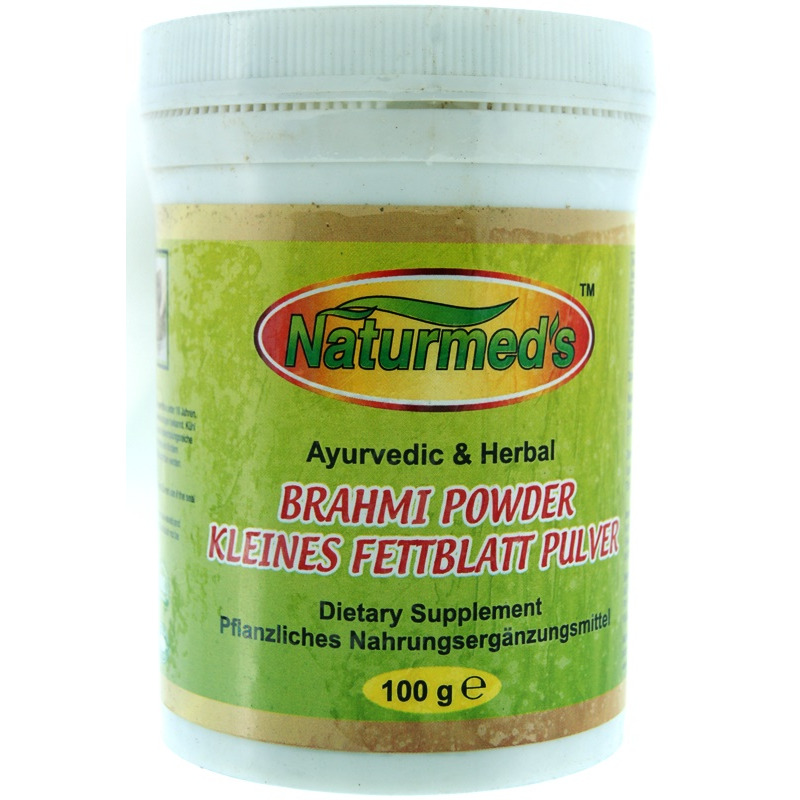 Naturmed’s Brahmi Powder (Bacopa Monnien) is prepared by grinding dried Brahmi leaves into soft powder. The Brahmi plant derives its name from Lord Brahma (the creator) and is a vital medicinal herb used extensively in various Ayurvedic treatments to promote mental health. Naturmed’s Brahmi Powder is 100% herbal and natural. Uses and Benefits It is believed to have the following benefits: - Brahmi powder is considered good for the brain. It is said to improve memory, clarity, intelligence and other brain functions. 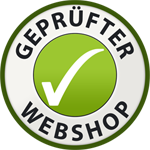 - It helps you become stress-free and relaxed. - It is also said to promote healthy hair. According to certain home remedies, it can be combined with other powders like amla powder and used as a paste to apply on the hair before washing it. This is believed to nourish the hair topically. Directions for use: Take two to three teaspoons at bed time with some warm water or as otherwise recommended. 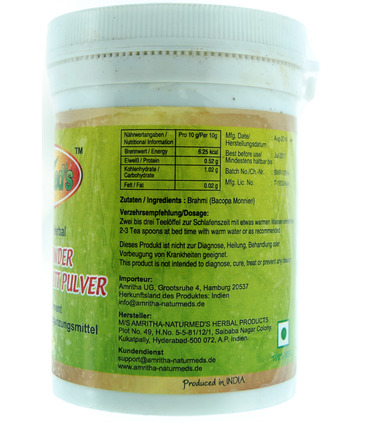 Naturmed’s Brahmi Powder (Bacopa Monnien) is prepared by grinding dried Brahmi leaves into soft powder. The Brahmi plant derives its name from Lord Brahma (the creator) and is a vital medicinal herb used extensively in various Ayurvedic treatments to promote mental health. Naturmed’s Brahmi Powder is 100% herbal and natural. 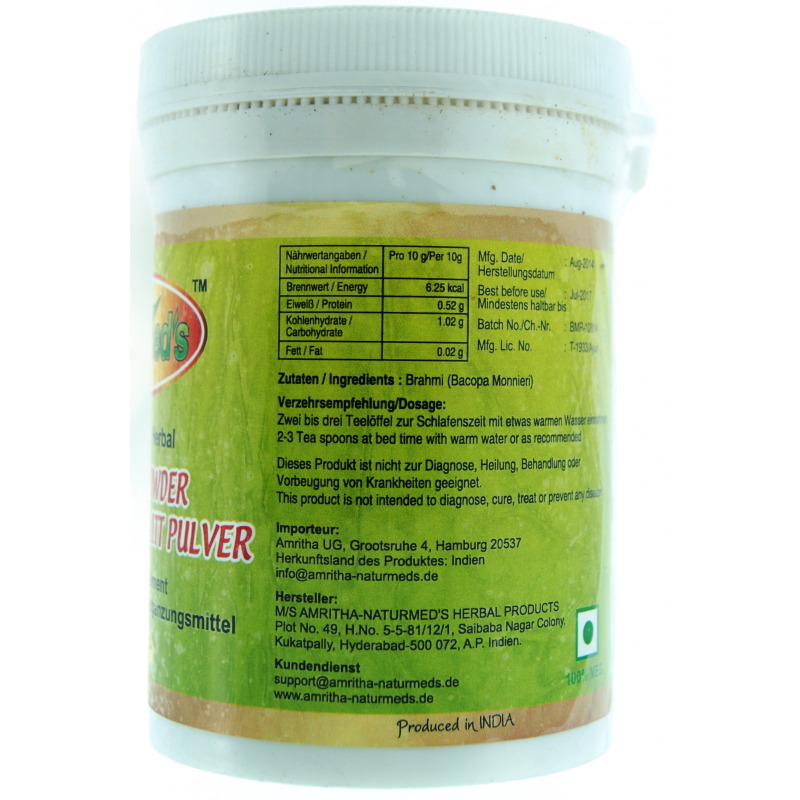 - Brahmi powder is considered good for the brain. It is said to improve memory, clarity, intelligence and other brain functions. - It helps you become stress-free and relaxed. - It is also said to promote healthy hair. According to certain home remedies, it can be combined with other powders like amla powder and used as a paste to apply on the hair before washing it. This is believed to nourish the hair topically. Directions for use: Take two to three teaspoons at bed time with some warm water or as otherwise recommended.